Primitive Fall Autumn Orange Pumpkin Rusty Tin Hanging Pocket. 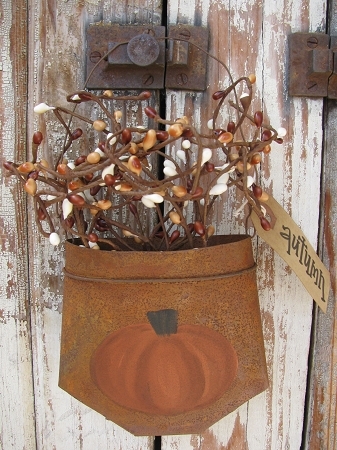 Primitive rusty tin pocket with a hand painted primitive orange pumpkin on it. I've also filled it with fall mix of colored pip berries and added a great primitive tea stained tag. You can choose your sayings below for what you'd like on your tag. Size of the pocket is 4.5" tall. Great for peg shelves, cabinet knobs and more. Hand painted by Heidi.